It is the best tool to monitor and control your devices, and here you find a few instructions to get you up and running. If you are not sure if you have the latest Linux version on your Yun you will need to upgrade. To upgrade or reinstall the OpenWrt-Yun image on your Yún, you’ll need to download the zip file from the download page. Once you’ve unpacked the file, move the binary image file to the root folder of a microSD card and insert the card into the Yún. 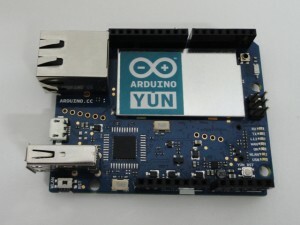 After WLAN reset and when you first power on the Yún, it will create a WiFi network called ArduinoYun-XXXXXXXXXXXX. Connect your computer to this network! 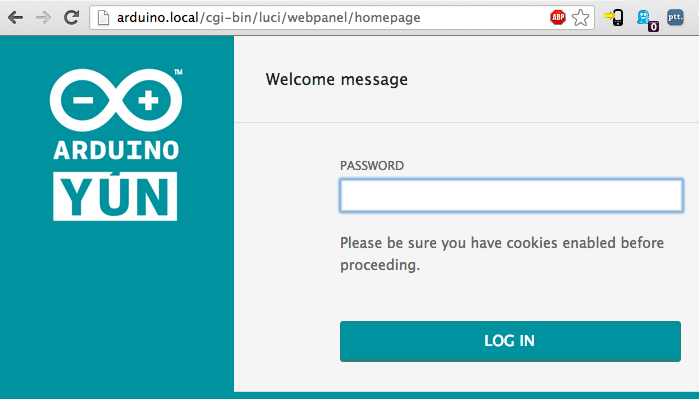 Once you have obtained an IP address, open a web browser, and enter http://arduino.local or 192.168.240.1 in the address bar. After a few moments, a web page will appear asking for a password. 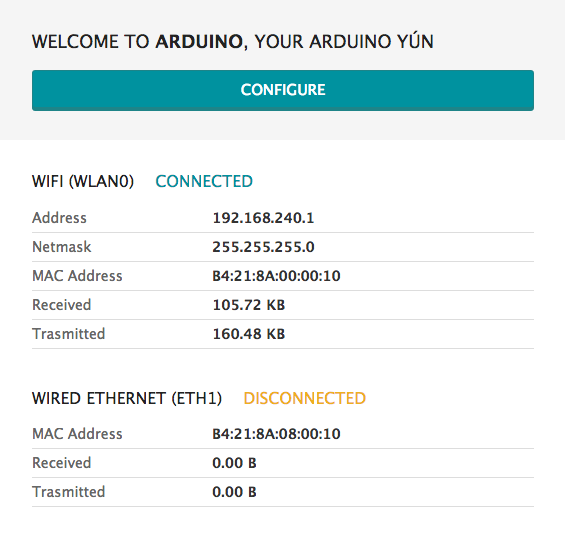 Enter “arduino” and click the Log In button. You will find a page with some diagnostic information about the current network connections. The first is your WiFi interface, the second is your ethernet connection. Press the Configuration button to proceed. On the new page, you will configure your Yún, giving it a unique name and identifying what network you want to connect to. In the Yún NAME field, give your Arduino a unique name. This is important if you plan to use more than one Yun on your network in the future. So if you name it yun123 you will need to connect to http://yun123.local the next time to want to configure the wifi settings. If you wish, you can set the timezone and country. 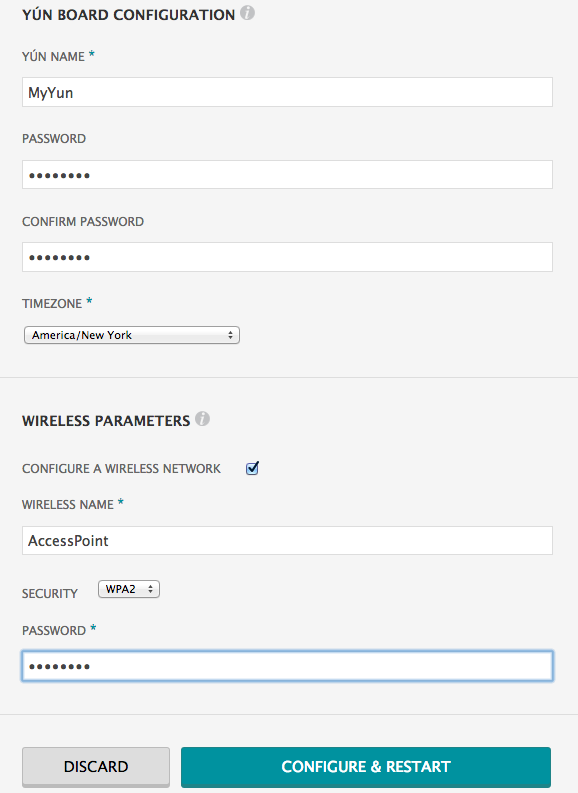 It is recommended to set these options as it may help connecting to local WiFi networks. Setting the local timezone also selects the country’s regulatory domain. Enter the name of the WiFi network you wish to connect to. Select the security type, and enter the password. When you press the Configure & Restart button, the Arduino will reset itself and join the specified network. The Arduino network will shut down after a few moments. You can now join the network you assigned to the Yún.